Melt butter, honey, brown sugar, soy sauce, and Worcestershire sauce in a small saucepan. Mix the Chex cereal, pretzels, peanuts, wasabi peas, and furikake in a large bowl. Add the liquid ingredients to the Chex mix, stir to combine. Bake on an aluminum foil covered pan for 1.5 hours at 250 degrees, stirring occasionally. So, you’ve made one of my homemade furikake recipes and now you’re wondering what to do with it? 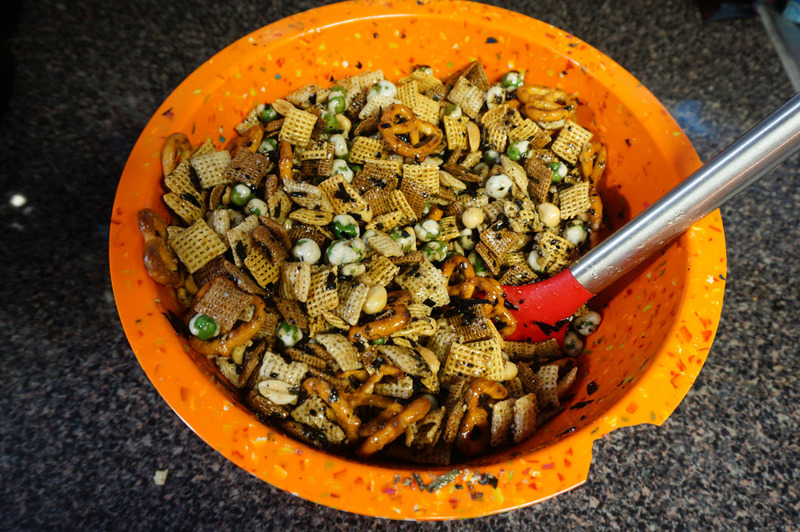 Well, besides sprinkling it on everything in sight, one of my favorite snacks to make is Chex Mix. And while Chex Mix is quite amazing all its own, I’m always looking for ways to make it better. At it usually involves soy sauce. 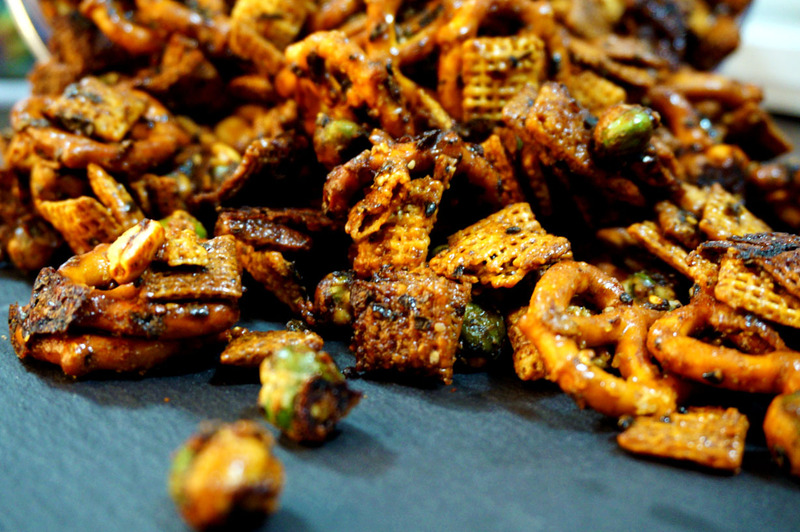 The idea for furikake flavored Chex Mix comes from the wonderful land of Hawaii. Being in the Pacific and close to Japan, it naturally has a pretty strong Japanese community. And of course having a Japanese influence, many American dishes there have been given a Japanese twist and vice versa. Along with Spam musubi, or Spam sushi, furikake Chex Mix has to be one of my favorite Hawaiian tastes, and it’s so easy to make! 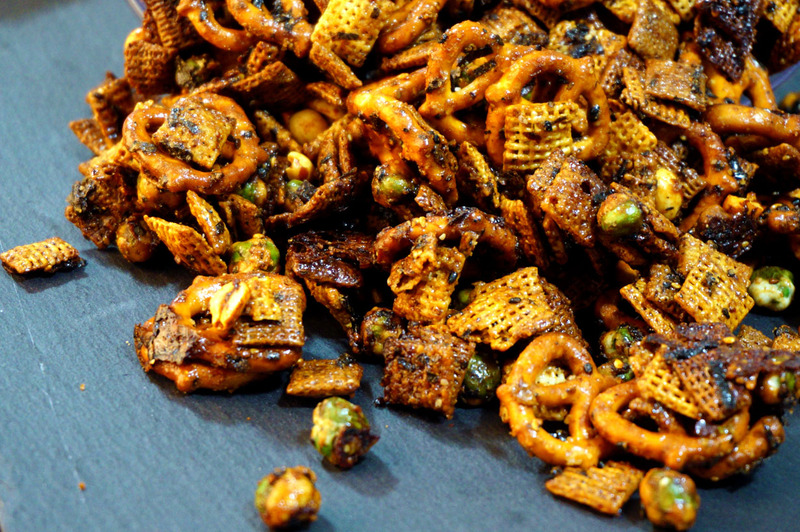 A pretty flexible recipe, you can easily add different cereal or crackers to get the mix you like the best. Feeling up for some goldfish or Japanese rice crackers? Maybe some popcorn? Go for it! And don’t worry, if you’re not a fan of wasabi, the baking takes away from the heat in the wasabi peas, leaving just a little wasabi flavor to blend beautifully with the other ingredients. Of course you can leave them out, but I really, really love them in the mix. 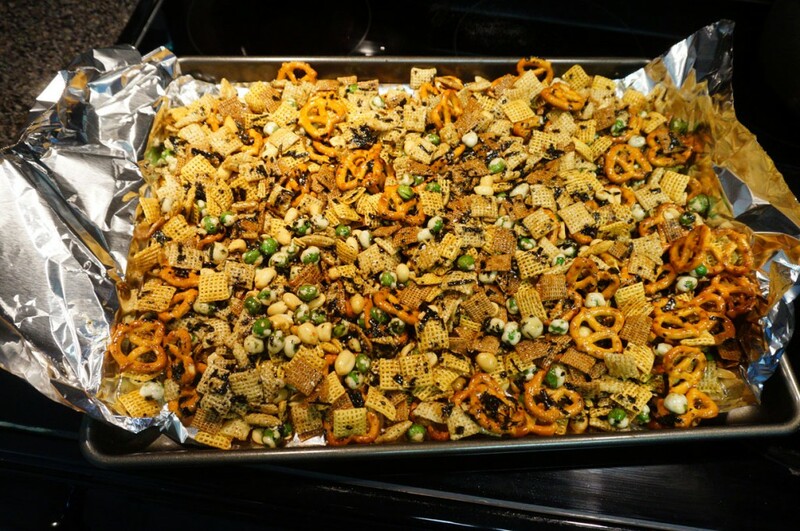 Chex Mix is a great party food, so this super easy recipe is perfect for entertaining, although I’ve been known to eat a whole batch on my own! As long as it’s cooled and sealed tightly, it will keep for a few weeks, so it’s great for making a bunch and having ready when you need a quick bite. – Preheat oven to 250 degrees. Combine butter, honey, brown sugar, soy sauce, and Worcestershire sauce in a small saucepan over medium high heat. 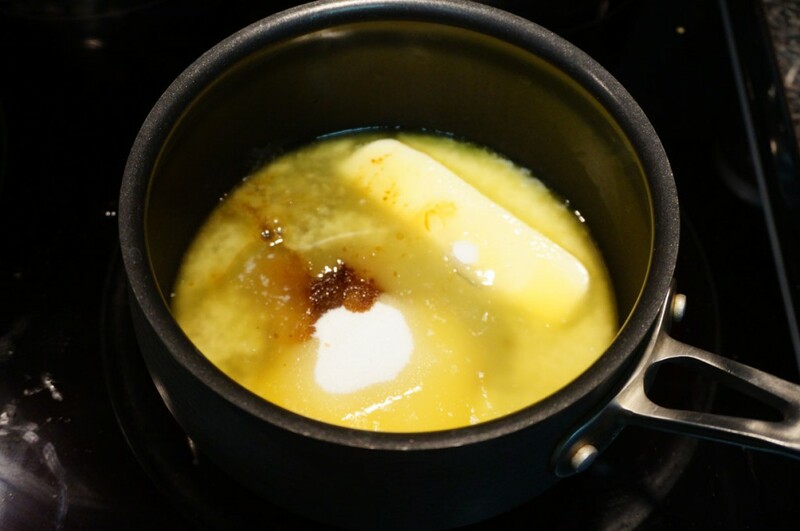 Stir until the butter is melted, then remove from heat. 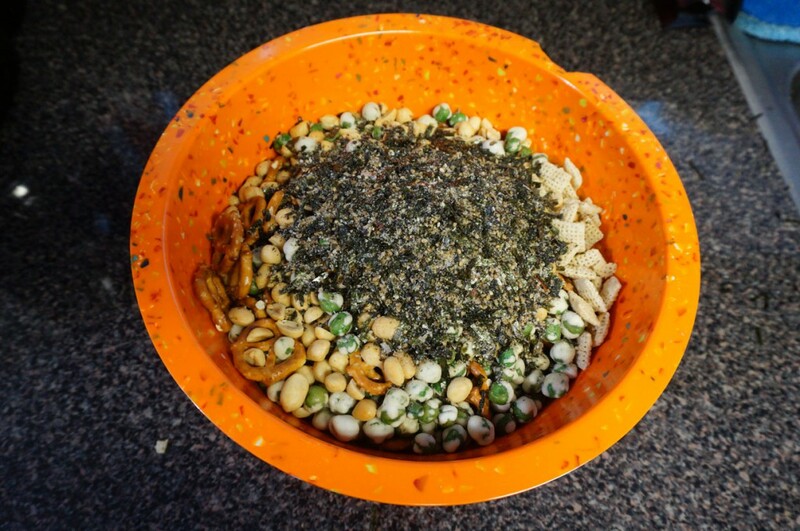 – Mix the Chex cereal, pretzels, peanuts, wasabi peas, and furikake in a large bowl. – Add the liquid ingredients and stir until evenly coated. – Spread the Chex Mix on baking sheets lined with aluminum foil. Let bake in the oven for 1.5 hours, stirring every thirty minutes. The Chex Mix is done when it’s lightly golden – the syrup will still be runny, but will harden as it cools, so don’t keep baking it waiting for it to harden, burnt Chex Mix is not yummy!! – Enjoy right away while it’s fresh and hot, or let cool and store in an airtight container until ready to eat! Out of five stars, what do you think? Hi. Looks delicious! Have you ever made a seafood version, like maybe with shrimp powder or something? If so, how was it? Thank you for the recipe. I tweaked it and added five spice, cayenne, black pepper, chopped ginger, teriyaki sauce, black and white sesame, kale powder, shrimp powder, onion powder and garlic powder (in addition to the original ingredients. It smells amazing and tastes even better thank it smells. Thanks again. From the bottom of both my heart and my stomach. That sounds delicious. I’ve never tried to make a more savory version, so I’ll definitely have to give it a try next time! Have you ever found yourself watching an anime and wishing that you could reach your hand into the screen and taste the food the characters were eating? Well if you have, you’re not alone. Living in the Southern US, there is a lack of authentic Japanese cuisine. So in order to experience real Japanese food, I had to learn how to make it myself.